Crystal Henry is a magazine writer based in San Antonio, Texas. Since 2005, her work has been published in lifestyle magazines across the country including "She," "San Antonio Magazine" and "Our Town." In 2006, she earned a Bachelor of Science in journalism from the University of Florida. Henry’s husband and two daughters provide side-splitting fodder for her award-winning column, Naked Salsa. Until now, you have been the center of your baby's world and his favorite source of entertainment. 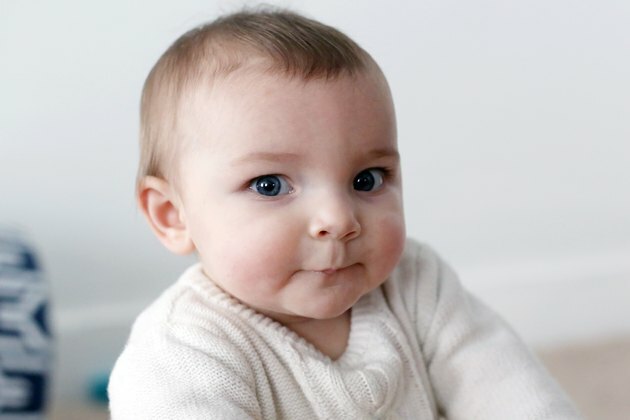 But around 7 months babies gain a new awareness of people and objects around them. Babies this age will start reaching for those objects, roll over to get them and start sitting up on their own. Your job is to help them safely explore these new interests and abilities. Tummy time is still important at this age, but encourage more movement with baby pushups. While baby is on her tummy, stand up and make silly noises or shake a favorite toy to get her to look up and lift her chest off the floor. 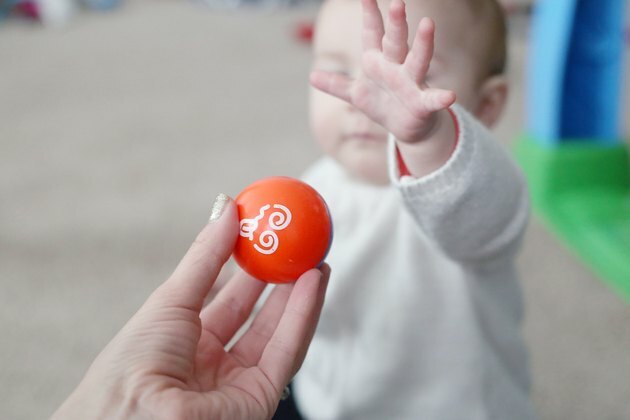 Put the toy just out of reach on the floor in front of your baby to encourage her to move forward. Sitting unassisted is a major milestone at this age, so help your baby out by providing a safe practice space. Support her with your hands or a pillow, and give her a toy to explore while sitting. Finish with some baby pullups. Help her pull to stand up from sitting, and let her bounce those legs a little before sitting back down. According to KidsHealth.org, these exercises help train baby's muscles and get her ready for future physical milestones. Your baby is now learning about object permanence, so he's starting to realize that you don't cease to exist when you take a quick bathroom break. Delight him with the magic of peek-a-boo. Hide behind a blanket, wall or behind your menu at dinner. Pop out and say "Boo!" and watch your baby light up at your reappearance. 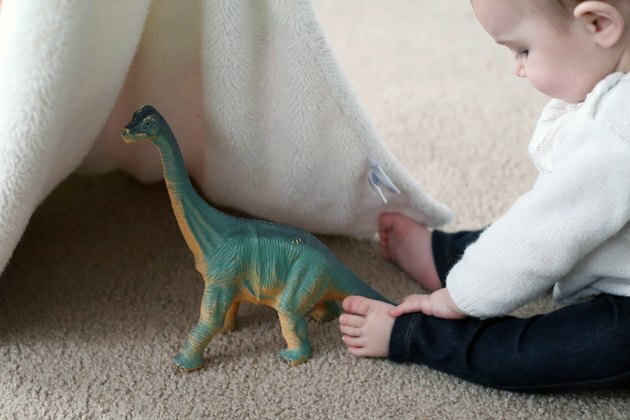 Hide a toy under a bucket or pillow, and encourage him to find it. Even the sometimes tedious game of picking up dropped spoons thrown from the highchair is a learning experience. This concept shows that your baby has reached a new milestone in his cognitive development with his memory and ability to think abstractly. It might still sound like nonsense, but those babbles and coos are your baby's early attempts at communication. She not only responds to the tone of your voice, but she's starting to piece together the way words form sentences. Many babies this age will respond to their names and start to associate words with familiar objects. Engage her in conversation by asking her a question and responding to her "answer." Narrate your day, read to her and emphasize simple words for familiar objects. Ask, "Do you want a ball? There's your ball," as you give her the ball. Pause and wait for her response. 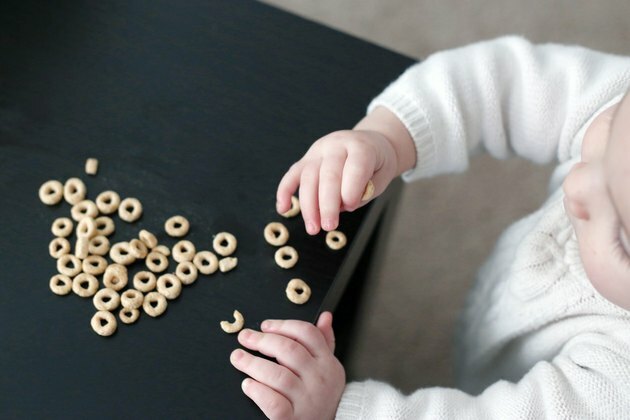 Even food becomes a game at this age as your baby starts to try and feed himself. At 7 months, babies will grab food with the fist and sometimes shove it toward their mouths. Parents.com suggests letting your baby practice by making messes. Closer to 9 months, as his pincer grasp develops, he'll be able to grasp bits as small as an O-shaped cereal between his thumb and forefinger. Once your baby can sit up unassisted, let him try to grab healthful bits of soft cooked vegetables, and always keep a close eye on him to prevent choking. Zero to Three: Sometimes My Baby Now Seems More Interested in His Toys Than Me!